Cover the outside of a van with amplified xylophone keys and gongs, approved give creative souls a pair of mallets each and see what happens. 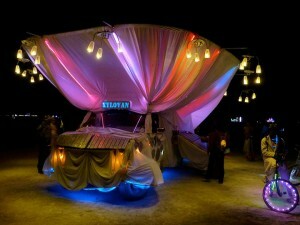 This is a step-by-step breakdown of how XyloVan came together for Burning Man 2010 – and many adventures beyond. Attempt to make roof-canopy frame out of PVC pipe. Fail. Sew like a maniac.